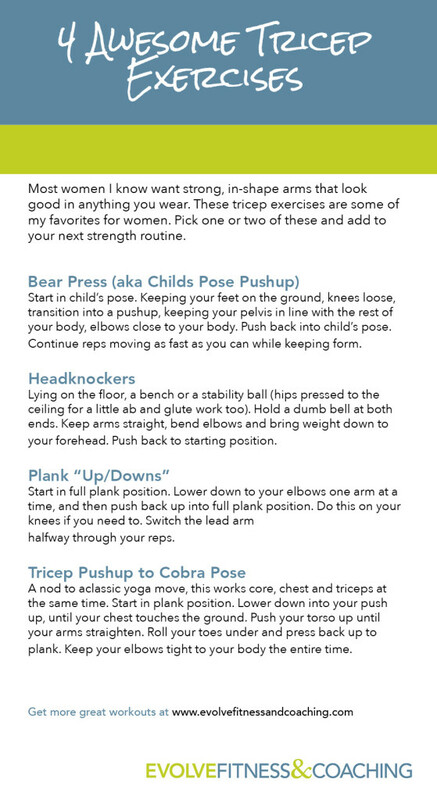 Most women I know want firm, toned arms that look good in anything you wear. And sometimes it seems like that’s the hardest thing to achieve since we tend to pack on a little extra somethin’ somethin’ on the backside of our arms that can be damn stubborn to take off. And because we stick with the basics when it comes to working our triceps. These four moves are some of the best triceps exercises for women since they won’t build bulk or target any single tricep muscle. They are also not your typical tricep move—you know the ones I’m talking about (extensions, dips, pull downs). Nope, these will target other parts of your body too, helping you to get stronger all over and burn more calories. Try them out so you get the mechanics of how they work, and then rotate them into your strength routine for a new challenge. can put to use right now.